We are a well-renowned organization in the industry to provide our patrons the best quality array of Modular Greenhouse Architecture. We have been an optimum dealer of Nursery Greenhouse which are being offered at a very genuine and economical market rate. 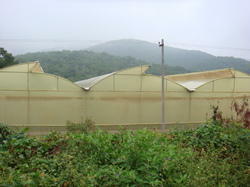 We have marked a distinct and dynamic position in the market by providing a high quality array of Agro House. De-leafing Machine and Brush Electrically operated defoliator is used as bunch cleaner. Machine is available in single phase and 3 phase options. Rubber Brushes strip the unwanted leaves from the Rose bunches. We manage Greenhouse For Orchid Flowers. Scratch resistant in nature, these Screen House are offered to the customers in multiple sizes. Light in weight, these houses are easier to use and do not get damaged by rough weather. In addition to this, these houses are developed by skilled experts very precisely with best and quality approved material. HortiMaX both develops and supplies business and process automation equipment for the commercial horticultural sector. HortiMaX can offer you the best solution to fit your needs in the areas of climate control, energy management, water management and labour and harvest registration. Fan & Pad SystemIn this type of greenhouse there will be use of Exhaust Fan and Cellulose Pad through which we can controlled climate within this types of Greenhouse. Green houses are climate controlled. Jain Green Houses have a variety of applications, the majority being, off-season growing of vegetables, floriculture, planting material acclimatization, fruit crop growing for export market and plant breeding and varietals improvement. - Designed for hot and temperate climates. .
- Designed to meet international for withstanding wind gusts up to 180 km/h and carry trellising loads up to 25 kg/m2. 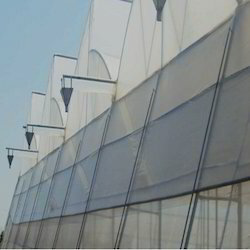 - Extra large gap, up to 1 meter, provides optimal ventilation even in tropical climates.